Gardeners everywhere can probably tell a great number of stories about their attempts to get rid of weeds. It’s not always a fun task (though some of us may find it calming) and it’s one of those things that we often put off doing. In that way, it’s a bit like uncluttering. It’s something we may need to do, but it may feel like a big undertaking. Did you also know that a weed can actually be any plant that is unwanted, even if it looks pretty and has beautiful blooms? Likewise, anything in your home that is unwanted, even if it’s in great shape (i.e., not broken or tattered), can be like weeds. We just classify those things as clutter. The difference between the two, of course, is that you can’t do much with the weeds once you’ve pulled them, but you do have several options when it’s time to unclutter and let go of unwanted items that are still in good condition. You can donate those things to a group or organization, pass them on to a specific person, or you can sell them. Though, you will likely not get the original value of the item, you will clear your space and get cash or a gift card in return. Recommerce is not a new idea, but it is one that has become more popular in recent times. This can perhaps be attributed to a tough economy, though some people sell to get an updated version of the item they’re letting go of. Whatever your reasons are, consider the four selling options below as you weed and sift through your belongings. You might end up choosing to only sell some things, but this list will at least get you started. Many of us are familiar with sites like Craigslist, eBay, and Etsy (e.g. vintage clothing) for selling (and buying) things. Those websites are still viable options, but there are many others that can help you transition your items to a new owner. Electronics. Gazelle.com will take your gadgets (mobile phones, tablets, desktop machines) — even broken ones — and send you a check, an Amazon gift card, or transfer funds to your PayPal account. NextWorth.com has a similar service and payment options, except that you can opt to receive a Target gift card. That site also has a referral program. If you decide to sell your electronics on eBay, be sure to check out their Technology & Electronics Selling Guide. Books. If you used Gazelle or TheNextWorth to get a new tablet or Kindle, you may be thinking about purging a few books. You can sell them on Amazon, SellBackYourBooks.com, or Cash4Books.net, to name a few. You will need the ISBN number (typically found on the back of the book or inside the book on the copyright page). Payments are made via check, PayPal, or an account of your choosing. Anything. Yardsellr.com uses the power of your social networks to help you sell your stuff. Log in using your Facebook account and let your friends see what you’re selling in your online yard sale. You will be paid via check or funds transfer to your PayPal account. There are no seller fees, however, Yardseller does markup your asking price. Check out their FAQs for more information. Pawn shops can be a good option for specific things you may want to sell (like guitars) so do a bit of research to find out what is successful through these stores in your area. Selling to a pawn shop may work well since they can often take a wide variety of things, though, because they resell your item, you might not get top dollar. But, they will take the item off your hands immediately and you will get paid at the time of drop off. If you have high-end clothing, shoes, jewelry, or antique pieces, a consignment shop in your neighborhood will consider selling your items and giving you a percentage of the sale. These stores tend to be pretty picky about the items they will accept and prefer to purchase things that are in excellent condition and seasonally appropriate. Some shops will require that you call to make an appointment, so be sure to check their guidelines before going. A new type of consignment shop has arisen in the last few years that does things slightly differently. ClothesMentor.com will buy your gently used and laundered women’s clothes, accessories, perfume, etc. The transaction takes place at one of their stores (use the store locator to see if they have a shop near you) and you will be paid immediately for the items they purchase. Plato’s Closet works in a similar way for “teen and twenty something guys and girls,” and you can either accept cash on the spot or trade your clothes for a new outfit. They also don’t require that you make an appointment. So, bartering is technically not selling, but it is a way to let go of things in return for a service that you may need. I read an article recently about someone who bartered a scooter to have her shed painted and dry walled. You may want to have a written agreement about the details of your exchange, and keep in mind that there are tax implications with bartering (read How the IRS Taxes Bartering for more information). Of course, you don’t have to sell your things at all. You can simply donate them or give them away to a specific person. You wouldn’t have to take your clothing to a re-seller shop, create online seller accounts, upload photos/descriptions of your items, or manage buyer inquiries. You can arrange for donations to be picked up free of cost or meet up with the person receiving your donation. Whether you decide to sell or donate, you’ll unclutter, free up some much needed space, and do something good for yourself. It’s difficult when you’re an artist to keep your workspace organized. As someone who spent two years of her undergraduate experience pursuing a painting degree, I can personally attest to the challenges of being neat and tidy when surrounded by so many supplies. My workspace was always a complete disaster zone, and I am in awe of artists who find a way to corral and contain all the stuff. One trick artists (and engineers and architects and anyone with a laptop) can implement to keep organized while they work is to use a standing-height, tilt-tabletop desk with storage trays attached to its sides, like Oliver. does in his studio. These desks allow you to sit in a raised chair or stand while you work, adjust the angle of your desk to best meet your ergonomic needs, as well as hold your coffee cup, phone, and whatever small supplies you need to do your job. And, when you’re done working for the day, you can unload the items and move them to their long-term storage spaces and have a clean surface ready for you the next time inspiration strikes. Thank you, Oliver., for submitting your wonderful workspace to our Unclutterer Flickr pool. As a junior-high student I learned two strategies for tackling writing projects: brainstorming and outlining. The former was free-form and messy; the latter tightly organized and formal. The idea was to brainstorm first and get all the ideas out of your head, without hesitation or editing. Imagine a dump truck depositing a payload of sand onto the ground. It’s effective, but you’ve got to do some clean-up work before you can move on with your project. After sifting through to find the usable nuggets, the next step was to arrange them in a tidy outline, which served as the backbone of the final project. Today, I still do these things, but with one change. The brainstorm has given way to a mind map, which combines the avalanche of sand with a little more order, akin to an outline. In short, think of a mind map as an uncluttered brainstorm. There’s lots of great software to help you create a mind map, though a pen and paper will do. Here’s how to create one, reap the benefits and find a software solution that works for you. You’ll find many definitions of what a mind map is, but mine goes like this: A mind map is a diagram used to organize a brainstorm. It starts with a single word — often the topic or heart of your project — inside a circle. Supporting ideas are drawn around the main idea inside their own circles and connected with lines. As an example, here’s a mind map I used for this article (at left). I started by writing “Mind Mapping” in the center, and then began to think about the topic. What about mind mapping do I want to share? That triggered the brainstorm and ideas came, like why do it, software available, organizational benefits, and so on. Each idea got its own “node” on the map. You’ll notice that “Software options” has three nodes of its own: Mac, PC and iOS. Those are referred to as “children,” as they all relate to the “parent” node, “Software options.” That’s where the organization comes into the process. Instead of generating a simple list during a brainstorm with no rhyme or reason to its order, a mind dump lets you group related ideas as you go, without hindering the brainstorm process. As you think of more ideas, just keep going, adding lines and nodes. Eventually you’ll reach the point of exhaustion and you’ll know you’re done. At this point, I’ll review the diagram I produced and use it to create an outline and finally begin my writing project. This method really helps me feel on top of my project, doesn’t produce a jumbled mess that must be sorted into an outline, and results in a better final product every time. 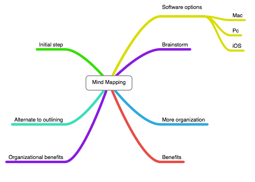 As I said, there are many pieces of software available to help you create a mind map. I’ll introduce you to four: one for the Mac, one for Windows, and two for the iPad. My favorite mind mapping software for the Mac is Mind Node. It’s no-frills interface lets you focus on your project instead of getting stuck fiddling with colors and other little tweaks. Branches are color-coded (you can adjust with the colors if you like) and there are plenty of keyboard shortcuts if that’s your thing. Also, built-in Dropbox synchronization keeps your mind maps available across Macs or even with Mind Node Touch for iPad. Nearly every writing project I complete, from a book to a blog post, begins life as a mind map in Mind Node. As for what’s different between the lite and pro versions, you’ll find features like image nodes, Wi-Fi sync between desktop and touch version, improved hyperlinks and improved printing options in the pro version. MindManager isn’t inexpensive but it’s extremely powerful. It will look familiar to anyone who has used Microsoft Office, as it uses a similar ribbon toolbar, which reduces the learning curve typical of new software, as does the built-in tutorial. Speaking of Office, there’s extensive support for Microsoft’s suite of apps built right in, and a number of export options, like PDF and Flash animations, making sharing easy, no matter what kind of computer your collaborators use. There are two great options for the iPad. The first is MindNote Touch, the sibling to the desktop app. It works in much the same way, but “touching” your ideas — to use a market-friendly phrase — adds some fun. Thanks to Dropbox, you can sync mind maps you make on your iPad with your Mac and vice-versa, which is very convenient. 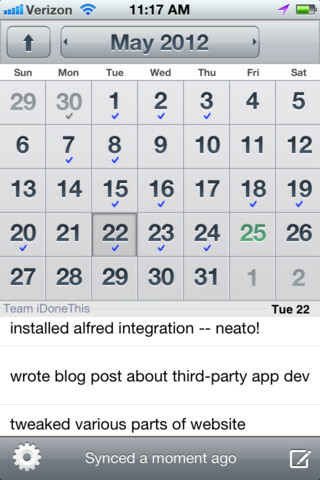 IThoughtsHD is another mind mapping app for the iPhone and iPad. There are a few features that set it apart but my favorite is the ease with which you can create nodes, child notes and sibling nodes. While MindNode requires you to move from the keyboard to the mind map itself to create and label nodes, iThoughtsHD lets you keep your hands on the keyboard at all times. For example, hitting the space bar three times in a row creates a new child mode. No need to move your hands up to the map. Likewise, hitting the Return key three times creates a sibling node. It’s very fast. I use mind mapping for writing projects, but that’s hardly its only use. I’ve also created map to organize a vacation, chart a video project, plan for a wedding and more. Give it a try the next time you’ve got a project on your plate that’s large or small, business or personal. You still have that powerful brainstorming session, but will avoid sifting through the resulting mess before getting on with the rest of the work. Now, anyone who has ever dined in a fine restaurant and enjoyed a bottle of wine is aware, a sommelier doesn’t set a wine cork down in a Cork Presenter after opening a bottle of wine. Wine etiquette suggests that the sommelier should hand the cork to the person at the table who is hosting the dinner. The person at the table inspects the cork to make sure that the printing on it matches the information on the label of the bottle (this is done to try to detect fraud), and then the sommelier usually guides the host to set the cork down on a small bread plate or just on the table or even to pocket the cork if the host wants to keep it. If a group of wine aficionados are at the table, the cork might be passed around for everyone to inspect, but eventually the cork makes its way back to the bread plate. What is nice about bread plates are that they can also be used for bread or cookies or anything else you would like to set on them. 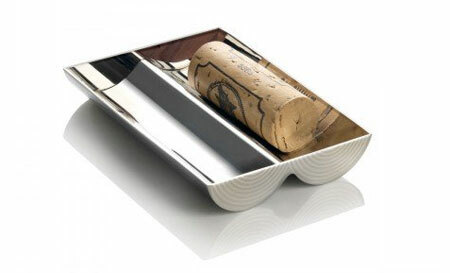 When opening a nice bottle of wine at home, a small bread plate can also hold a wine bottle’s cork, just like it does at The French Laundry. 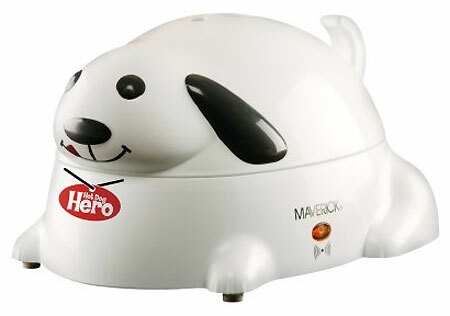 Oh, and this little unitasker costs $30 — further proof of my belief that manufacturers are just rolling around laughing at their customers from their Scrooge McDuck money bins. Thanks to reader Jeri for sharing this unitasker idea with us. Sometimes technology, though often helpful, can be daunting. You can spend a lot of time trying to learn how to use a new app (or gadget) before really being able to use it to your benefit. That’s why it’s nice when you come across an app that is simple and easy to use while helping you keep a regular habit of getting things done. I recently discovered two that I’d like to share with you: Wonderful Day and iDoneThis. Don't you just love an app with a happy sounding name? Well, it does a bit more than just sound happy. This app is based on Jerry Seinfeld's (not so secret anymore) productivity secret, also known as Don’t Break the Chain. 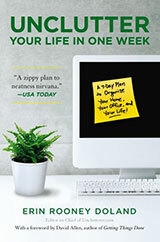 It’s a very simple concept – work on a task every day, and when you do, cross it off on your calendar. You’ll end up having a chain of X’s or check marks (or whatever mark you prefer) on your calendar. If you miss a day, then you will have a break in your chain. Over time, you’ll be motivated to keep the chain going, and if you’re like some people (moi), you won’t like seeing a broken chain. Wonderful Day allows you to make your own chain sans the paper calendar. There’s nothing wrong with using paper, if that’s your preference. But, if you’re more tech inclined, this process can’t be any more simple. 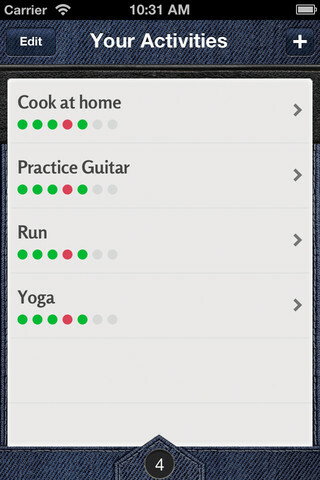 You can set multiple tasks that you want to focus on as well as the days you’ll work on them. You might have “exercise,” “write,” and “work in the garden” on your list — anything you think you’d like make a habit of doing. Each time you complete a task, you’ll see a green dot, and when you miss a task, you’ll see a red one. If you’re a visual person, this app may work very well for you. iDoneThis is extremely simple and doesn’t have a lot of bells and whistles (though you can sync with your web-based iDoneThis account). But, it’s very easy to use and can help you build a habit or routine of accomplishing a task every day. You will likely be motivated to get something done just to keep the “done” chain going. This is typically the first step in the clothing review process. You can’t really know what you’re going to keep or donate until you find out exactly what and how much you have. If you have clothes in several places, gather them together so that you can really see how large (or small) your stash is. Sometimes we forget where we store things, so check on high shelves, under the bed, in the guest room (in the closet and under the bed in there, too, if you have a guest room), basement, attic, outdoor storage units, and the laundry area. Once you have them all together, use a flat surface like a table or your bed as a staging area for sorting and categorizing. Now comes the hard(er) part, making decisions about what gets the boot and what gets lovingly placed back inside your closet. So, how often do you really wear all your clothing? Frequency of use can be used as a benchmark when you’re deciding what you’ll keep. Some things may only be worn once in a while (e.g. for special events) while others are not worn because you no longer like them or because you haven’t seen them. If the latter statement refers to you, give them until the end of this season to see if you reach for them. If you don’t, they are probably good candidates for your favorite charitable organization. Do the same for clothes that you just don’t fancy anymore. Are you still holding on to clothing that you used to love? You don’t have to get rid of everything in your closet and there’s nothing wrong with keeping a few items because they have high sentimental value. But, if your closet is filled with many clothes that you used to love but don’t wear anymore, it’s time to look at things a little differently. And, don’t just buy something because it’s on sale. It has to “make your heart sing,” so says Stylist, Stacy London. You might also want to think about which item will leave your closet so that your new purchase can move in. Do your clothes still fit and flatter you? Look with a critical eye at each article of clothing. Are they flattering to you now at your current size? Try them on to see how you look and feel in them, especially while you’re still at the store. It will take a little more time to do this, but consider the time you’ll save by leaving something unflattering at the store instead taking it home only to return it later. Do your clothes still fit your current lifestyle? Think about your current lifestyle while you’re in decision-making mode. Do you need to attend a variety of diverse events that require several types of clothing, or can you wear some of the same outfits? Has your style evolved over time? If the prospect of searching for clothing that will make you look your best is a bit daunting, you can use an in-store stylist to help you select a few core pieces. Many stores, like Nordstrom, offer this service (for both men and women) free of charge. This doesn’t mean that you have carte blanche to buy any and everything. But, you may get advice that will help you make wiser purchases and help keep your closet from being filled with things that you will never wear. How will you put everything back? Before putting everything back in your closet, first figure out if any of your items need to be laundered or taken to the dry cleaners. Some things, even though you may have already worn them once or twice, can go directly in your closet. A recent article in the Star Tribune noted that it’s okay to wash your jeans “intermittently” but jackets and blazers can be worn up to six times before needing to be cleaned. You can also take a look at Real Simple’s The When-to-Wash-It-Handbook for “when to wash” tips on various items, including delicates and everyday wear. Group like items together (e.g., all the pants together, all the shirts together, all the dresses together, and so on) and keep in mind that not every item should be put on a hanger. Sweaters, for instance, keep their shape best when they are folded (find more clothing tips in Martha Stewart’s Homekeeping Handbook). Color coordinating (i.e., keeping similar hues together) the clothing in each category will help you to find what you’re looking for more quickly and see the colors you tend to gravitate toward. Consider using hangers of the same type and color to give your closet a neat and orderly look. By maintaining a uniform look, you’ll be more likely to things back where they belong. Keep donation basket or bag in your closet or laundry room for clothing that you haven’t worn in awhile or simply don’t like anymore. No matter what structured elements you decide to include in your closet, put things back in a way that makes sense to you. Avoid creating a system that is too complicated to keep up with and the next time you decide to organize your closet, you’ll be pleasantly surprised at how much easier the task will be. The quote at the end of Tuesday’s post by Anthony Graesch has been on my mind: “The inflow of objects is relentless. The outflow is not. We don’t have rituals, mechanisms, for getting rid of stuff.” After an initial uncluttering project is completed, what rituals and/or mechanisms do you suggest to maintain an uncluttered space? When should we unclutter our homes again? Many groups of people have uncluttering and cleaning as a ritualistic component of their culture. For example, in many south Asian countries in preparation for Diwali the entire house is cleaned and all old clutter removed before a family begins celebrating. This holiday is in the last quarter of the calendar year when temperatures are mild (60ºFs and 70ºFs) and families can work both out and indoors. Some sub-groups even include painting and decorating as part of this ritual, where walls get a fresh coat of paint and older decorative items are replaced with new (pictures are even swapped in frames). There is a religious purpose for this behavior, but even the non-religious observe the secular aspect of uncluttering and cleaning around this holiday. On the whole, we don’t have such holidays in the U.S. where everyone observes a ritual for annually cleaning and uncluttering our spaces. I’ve noticed most families only go through such whole-home uncluttering activities when moving or right before entertaining guests. And, when entertaining guests, it’s usually more of a pick-up and put-away surface cleaning than a deep uncluttering and cleaning. As a result, I agree with Graesch and his statement that most families bring stuff in but rarely let stuff go. We’re definitely a culture of acquisition. To maintain an uncluttered home, I think it’s a good idea to have habits and traditions in place to keep the outflow of goods equal to (or greater than) the inflow. Don’t bring clutter in. Keep a trash can, recycling bin, and shredder near the main entrance to your home so you can immediately trash the trash, recycle what can be recycled, and shred anything you don’t need that contains personal information on it (like those preapproved credit card applications you get in the mail). One-in-one-out. Try your best to get rid of one item each time you bring in a newer item (this works for most products except for quickly consumable items like food). For example, if you buy a new pair of jeans, get rid of your oldest, hole-iest pair. If you’re starting to notice one-in-one-out isn’t enough, aim for one-in-two-out or one-in-three-out. Permanent box for charity. I also recommend keeping a Rubbermaid bin in your laundry room for deposits of donation items. I suggest the laundry room because it is incredibly simple to pull a piece of clothing you no longer want out of the dryer, fold it, and then put it straight into the donation bin. A sturdy bin is great because it can also hold non-clothing items you wish to donate to charity. Once the bin is full, toss it in the car and take its contents to your charity of choice. Put things away after you use them. When you put things away after you use them, you don’t have stray items all over your home and you know when your storage spaces are getting full and ready for uncluttering. It also helps you avoid having more possessions than you can store. Spring cleaning. Getting your home ready for the warmer months of the year is good for many reasons. You’ll be able to clean things thoroughly, as well as notice if any damage has taken place to your home over the winter months. 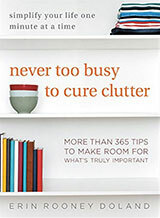 For a comprehensive list of spring cleaning tasks, check out pages 185-190 in my book. Fall cleaning. Just like spring cleaning, it’s always a good idea to get your home ready for the cooler months of the year. For an exhaustive list of fall cleaning tasks, check out pages 100-105 in my book. If these winter, spring, summer, and fall times don’t work for you, find times that do — the week before your birthday, the week before Easter, every weekend in October, etc. Attach rewards to the end of these projects so you have something to look forward to, in addition to your uncluttered and cleaned home. Also, be sure everyone in your home is involved in working to get things done. Everyone should feel responsible for and have a stake in the smooth running of the home. Thank you, Sasha and the others, for submitting your question for our Ask Unclutterer column. I’m 99 percent certain this is a dog since it’s wearing a collar and “barks,” but one percent of me thinks it might be a rabbit. Whether dog or rabbit, animals’ innards should not be cooking meat products. It’s reminiscent of seafood restaurants with tropical fish tanks lining the walls and daily the fish in the tanks are forced to watch their cousins being eaten off dinner plates. I find it all very unsettling.